For the second year in a row, faculty, staff and students from Wilfrid Laurier University’s Faculty of Science have come together to build a giant structure out of food containers, all in support of the Food Bank of Waterloo Region. 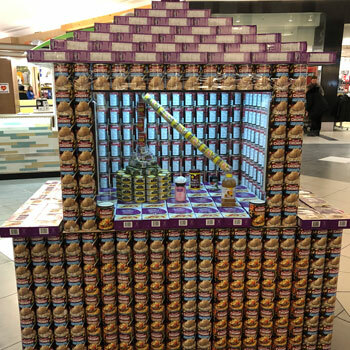 This year’s display, a fume hood made up of about 1,400 containers, mainly cans of soup and boxes of dried penne, is titled “Synthesizing an End to Hunger.” The fume hood, complete with a window, solar-powered lights and a chemistry experiment, is one of 15 “Canstruction” installations on display at Conestoga Mall in Waterloo, all vying for the People’s Choice award. People can vote by donating until March 17 either in person at Conestoga Mall or online. The installation that raises the most money – not votes – wins the People’s Choice award. One dollar provides three meals for a member of our community in need, while $50 provides 150, according to the Food Bank. The structures will be on display at Conestoga Mall until March 17. A team of five students and seven faculty and staff put together the fume hood. Spearheading the project were Ruth MacNeil, senior administrative officer for the Faculty of Science, Ron Daniels, program coordinator for the LaunchPad Science Maker Lab, and Bruce McKay, associate professor in the Department of Psychology – the same team that put together last year’s award-winning giant microscope. This year, McKay and two students thought up the fume hood idea, while Daniels worked with a student to measure containers in the grocery store and design the hood with help from 3D design software in the Science Maker Lab. MacNeil worked behind the scenes, purchasing and coordinating the delivery of the food. The People’s Choice award winner will be announced March 18 on the Food Bank of Waterloo Region website and social media accounts.